AJ and Matt met randomly during a house party in Chicago in 2011. They hit it off in conversation and exchanged social media before phone numbers. After an amazing coffee date where they both hit it off, things quickly got serious and the rest is history. After things continued to get serious the couple agreed that they both had to propose to each other should they ever get married. On their dating anniversary in June Matt proposed to AJ during a trip to Los Angeles, on the Santa Monica Pier. On September of that same year, AJ proposed to Matt near the famous Field Museum in Chicago, overlooking the entire skyline. After the engagement, the couple opened a joint savings account, as they needed to pay for their wedding on their own. As they began to learn more about destination weddings and how cost effective they were, they found Suzy with Destify online. She recommended the Puerto Vallarta area of Mexico, a very LGBT-friendly location, and sent them several resort suggestions. 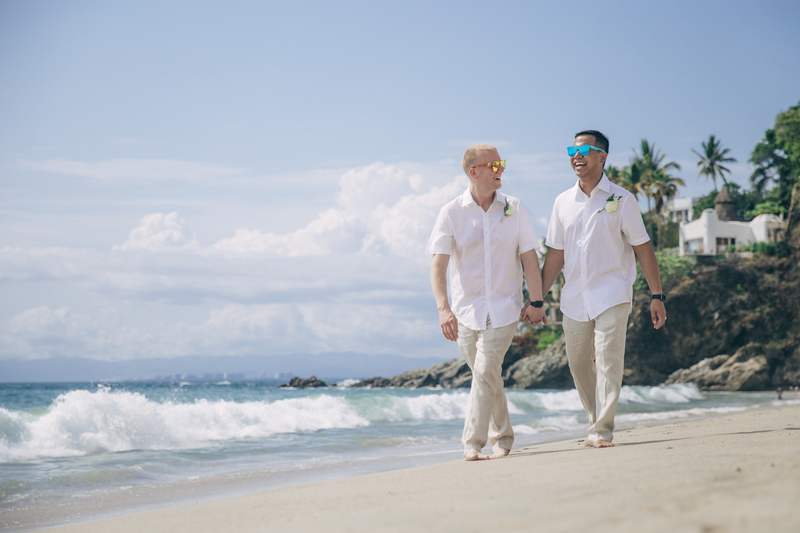 They chose the Hyatt Ziva Puerto Vallarta because the wedding venue pictures looked amazing and the resort had received outstanding reviews. Suzy coordinated travel and room accommodations for their guests. The couple credit the Hyatt Ziva wedding department as being wonderful to work with. Their officiant even sent an outline by email explaining how their wedding proceedings would happen. Neither Matt or AJ consider themselves planners so having the wedding department take charge of the process was a relief. Once on-site the couple were free to enjoy their vacation in beautiful Puerto Vallarta, along Mexico’s west coast. They held a 4pm ceremony at the rooftop gazebo, overlooking the ocean. After taking pictures as a couple together on the beach, they joined their guests for the reception. The couple loved how much of an amazing time everyone had, and they were surprised to have exactly 50 guests in attendance. In fact, their guests are still talking about the trip! The Hyatt resort was outstanding from start to finish, and they were happy with the welcoming environment.. The couple highly recommends hosting a destination wedding. The best part was that everything is taken care of, you don’t have to worry about any further finances once you’re there. It’s a win-win for you and your guests, everyone gets to go on vacation.